For those of you following my blog for a while and reading about my hesitations weather to work with stones or not, this design will probably come as a surprise, or maybe not? so here are the very first birds from a larger collection of crocheted potion bags with a stone. 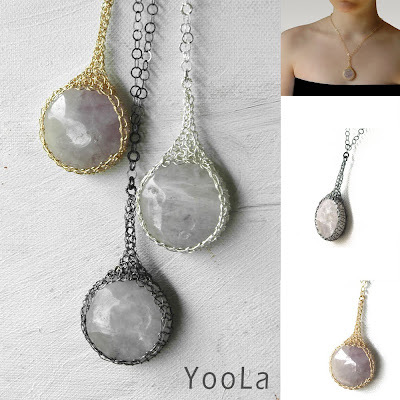 The stones I picked for my very first designs are large pale amethyst, onyx coins in a mat finish and light turquoise coins. I was looking for a design where the stones wont necessarily win over the knitting....where both get to contribute to the relationship and relate to each other. oh wow, these are stunning!!!!! !